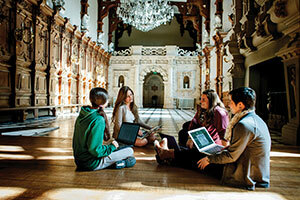 Virginia Wesleyan University offers study away courses taught by our own faculty. The 2018-19 courses are listed below. For more information about individual courses, contact the faculty instructor directly. Students may apply for the Lighthouse’s Study Away Course Grants. For more information, please contact Prof. Deirdre Gonsalves Jackson (dgonsalvesjackson@vwu.edu). Registration for Winter Session 2019 opens for incoming first-year students in June and for returning student on September 17th. Description: This course introduces students to metrology as it applies to global commerce as well as the measurement systems and standards it generates. Students engage in high-level measurement practices with scientists at the U.S. metrology institute, the National Institute of Standards and Technology, in the Washington DC area. Students investigate how industrial chemists, regulated by those standards, ensure compliance with product specifications in a commercial laboratory; including day trips to local labs in Virginia. This is an advanced elective for science majors. Prerequisites: CHEM 120 and the successful completion of any 200-level chemistry course with a grade of C or better. For more information, please contact Prof. Maury Howard (mhoward@vwu.edu). 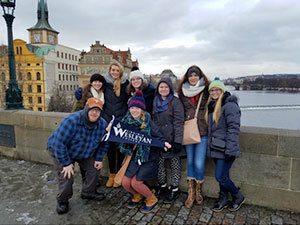 Description: This course explores the history of Prague from its founding in the tenth century, through its medieval years, its Early Modern period, the nineteenth century, its existence at the capital of Czechoslovakia, to finally its current post-communist life. The course employs Prague, one of Europe’s most beautiful cities, as a text to examine Czech identity and memory throughout the centuries. Students earn “Historical Perspective” credit. For more information, please contact Prof. Sara Sewell (ssewell@vwu.edu). Description: Combining perspectives based on the sciences and the humanities, this course examines the ways that societies adapt to and transform the natural environment. 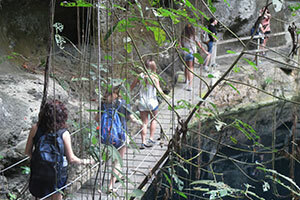 Beginning in the magnificent ancient cities of Chichen Itza and Ek-Balam, we enter the Mayan world of science and religion. Our course includes a visit to Universidad de Oriente in Valladolid, Yucatán where a specialist in Mayan cosmogony guides us through the study of medicinal plants and the notion of holistic healing. 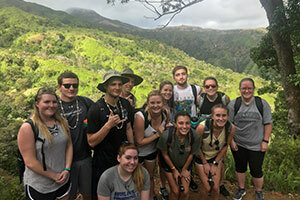 Students have an opportunity to research regional resources in interaction with local people and specialists in order to explore the co-evolutionary process by which man transforms and is transformed by the natural environment. For more information, please contact Prof. Diana Risk (drisk@vwu.edu) or Prof. Dan Margolies (dmargolies@vwu.edu. For more information, please contact Prof. Doug Kennedy (dkennedy@vwu.edu). Description: This course studies key authors of faith literature burgeoning out of Oxford University, including Dorothy Sayers, Charles Williams, C S Lewis, J. R. R. Tolkien, plus an immersion into their University world. For more information, please contact Prof. Terry Lindvall (tlindvall@vwu.edu). 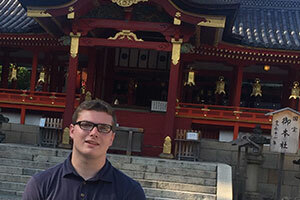 Description: This course provides an overview of Japanese political, economic, social, and cultural history with an emphasis on the nineteenth and twentieth centuries. A major focus is a close examination of the impact of the capitalist world system on the formation of modern state and society. We also learn about the intangible cultural heritage of Japan in the forms of food, music, and art. This course is a 1-credit enhancement to the 4-credit spring 2019 semester course. For more information, please contact Prof. Dan Margolies (dmargolies@vwu.edu). Description: This course introduces students to the political, social, religious, economic, intellectual and literary developments that ushered England from the late Middle Ages into a renaissance of culture under the Tudor rulers. Topics include the Lancastrian ascendancy, the Wars of the Roses, early Tudor humanism, the Henrician “revolution.” the English Reformation, the “Little Tudors” and the reign of “Gloriana” Elizabeth I. Students gain an appreciation for the failings and triumphs of human nature through their study of the great events and personalities of the Tudor age. For more information, please contact Prof. Clay Drees (cdrees@vwu.edu). 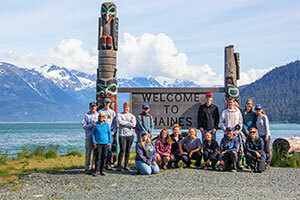 Description: This course focuses on the distinctive and dramatic landscape of Southeast Alaska to illustrate the interconnectedness between the major forces that have shaped our planet and how its inhabitants live their lives. It emphasizes the complex relationships that exist throughout the natural world and how they interact to have economic, social, cultural, and philosophical implications. Prerequisite: Batten Honors College. For more information, please contact Prof. Larry Hultgren (lhultgren@vwu.edu) or Prof. Elizabeth Malcolm (emalcolm@vwu.edu). 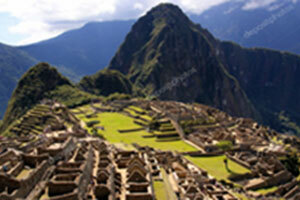 Description: This course investigates and experiences two adjacent and long-interrelated areas of Peru. We’ll go off the grid for five days into the Amazon jungle, which is perhaps the most biodiverse area on the planet, then go high into the Andes to the heartland of the Incan empire, including a visit to one of the world’s great sights, Machu Picchu. In both places we’ll spend considerable time with indigenous peoples, learning through them a different way to understand not only their but our own world. Prerequisite: Batten Honors College. For more information, please contact Prof. Michael Hall (mhall@vwu.edu). Description: An introduction to German politics over the last 60 years. It relates the historical developments in 20th-century Germany to global and international developments. A special focus is the political historical development of Berlin, which provides the background for different excursions in the city. The course seeks to bring history to life by taking you to historical places that relate German politics to international developments. Movie screenings and guest lectures also facilitate the understanding. As a service project, students engage with Syrian refugees that arrived in Berlin in great numbers over the past two years. Prerequisite: Batten Honors College. For more information, please contact Prof. Antje Schwennicke (aschwennicke@vwu.edu). 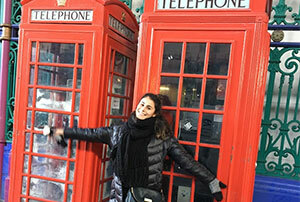 Description: Students are given the opportunity to experience and explore the humanities in London. 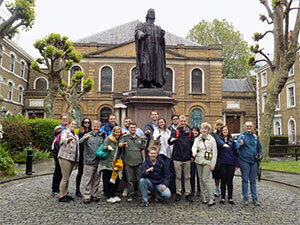 The course includes tours of local attractions, historical sites, attendance at theatrical performances, and museums. 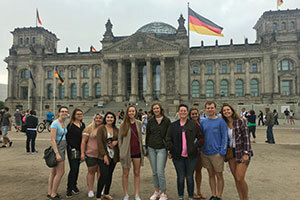 In both classroom activities and the tour, students are given a new perspective on a city rich with historical and cultural diversity. For more information, please contact Prof. Sue Larkin (slarkin@vwu.edu) or Prof. Travis Malone (tmalone@vwu.edu). Description: Acknowledging that health, illness, the practice of medicine, and medical institutions are social and cultural as well as matters of biology, this course is designed and structured to introduce a sociological examination of medicine and medical knowledge. 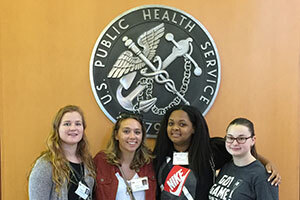 Students visits locations that combine to tell the story of medicine and how medical knowledge is created, ranging from the lens of historical perspectives to cutting-edge research. For more information, please contact Prof. Kathy Stolley (kstolley@vwu.edu). Video by Stephanie Harron '15.